The toponym derives from the Patron Saint of the castle, San Giorgio, and from the geographic location of the town in the plain. San Giorgio di Piano is a typical small town of the Bolognese area. 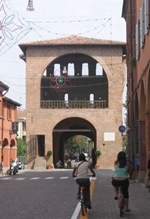 Its historical centre, remarkably well-preserved, has a characteristic "torresotto" (tower) from 1321, today the public library. It is worth seeing the Palazzo Comunale (Town Hall), built at the end of the 18th century, and the 19th-century Romanesque Church of San Giorgio. Of the ancient castle built in 1403, there remains only Porta Ferrara , with the typical slits for the drawbridge. Near where there was once Porta Bologna, the Oratory of San Giuseppe and the Nativity of the Madonna (18th century) contains a Sacred Family of the School of the Guercino. A popular site for film-loving pilgrims is the birthplace of Giulietta Masina , workmate and wife of Federico Fellini. You can see the facade of her house in the main street of the town. The territory between San Giorgio di Piano and San Pietro in Casale was the site of a historical battle: in the area of Gherghenzano, Annibale I Bentivoglio defeated the army of the Viscount in 1433. As evidence of the past centuries, there is a monumental plane tree, a good 33 metres tall.